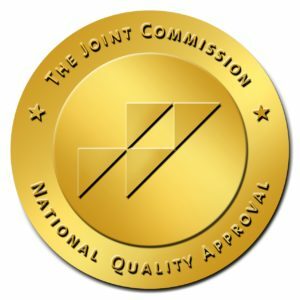 What is The Joint Commission Gold Seal of Approval®? Our facility voluntarily underwent a thorough evaluation by the Joint Commission. the goal of the evaluation? To see if our facility meets The Joint Commission’s rigorous performance standards in delivering quality, safe care. By meeting these standards, our facility received The Joint Commission Gold Seal of Approval®- an internationally recognized symbol of quality. The Joint Commission accredits more than 20,500 organizations worldwide and focuses on continually improving health care by setting the highest standards for health care qualtiy throughout the world. In setting the standards, the Joint Commission consults doctors, nurses, and qualtiy and safety experts to review the current standards and make recommendations for improvements. For more information about Joint Commission accreditation, visit www.jointcommission.org. To find other accredited health care organizations that have received the Gold Seal of Approval®, visit the Quality Check® section of The Join Commission website or www.qualitycheck.org. To access Inland Behavioral and Health Services, Inc. official report from joint commission click here. Whenever and wherever you receive health care, look for The Joint Commission Gold Seal of Approval®. To file a complaint with the Joint Commission click here.